(1) What is a 'keeper', and (2) do I need to use one if I take the armature out of my rotating-coil magneto? We are now selling magneto bearings, insulators, oil seals and armature shims from our on-line shop. NEW ... Take a look at some of the equipment we use in our workshop for magneto servicing and overhauls. What is a 'keeper', and do I need to use one? What causes a magneto's magnet to lose its strength? In short, (1) a keeper is a piece of iron or steel used to help a magnet retain its strength, and (2) for some magnetos, 'no', but for others, 'yes'. 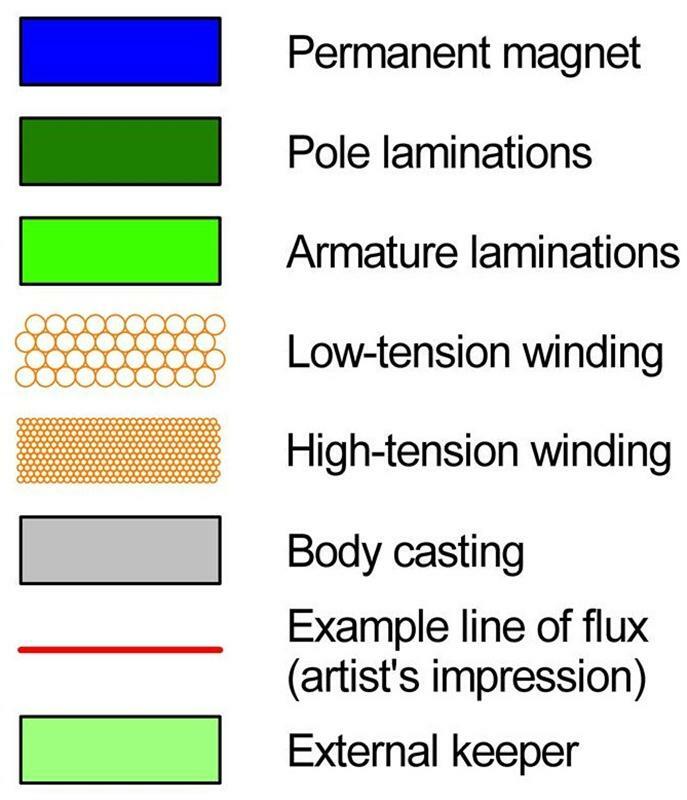 In detail, permanent magnets like to have an easy external path of, for example, steel or iron for the magnetic flux to flow along between their poles. 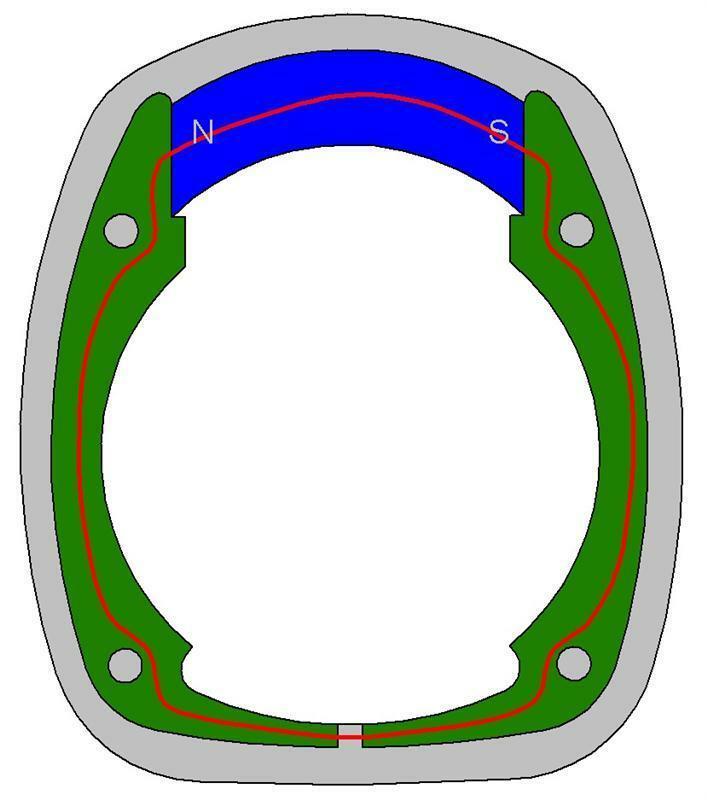 If the path is made more difficult and the magnet has to force its flux through a lot of air or non-ferrous material, it immediately permanently loses some of its strength. How much depends on the material of the magnet, its shape and the maximum amount of difficulty it has encountered since it was magnetised. A 'keeper' is a piece of iron or steel that is placed between the poles of a permanent magnet when it is not in use to maintain an easy path for the magnet's flux. 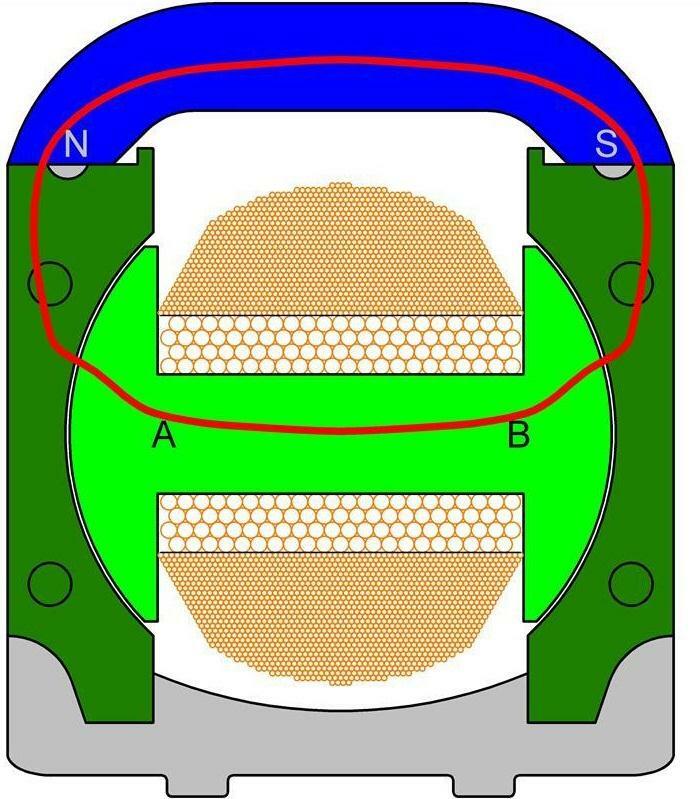 The drawings show the alnico magnet (blue) and its steel pole laminations (dark green) of a Lucas K-series magneto and a BT-H KC series magneto. 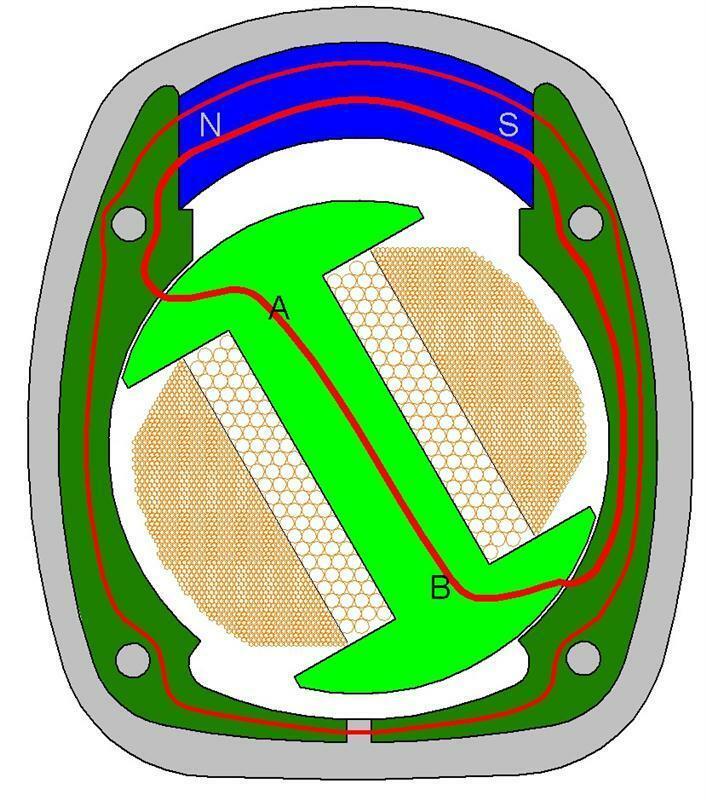 The armature has a laminated steel core (light green). When the armature core is aligned with the poles (as in Fig. 1) or rotated through, say, 60 degrees (as in Fig. 2), there is a relatively easy path for the magnetic flux through the pole laminations and the armature core and across the narrow but extensive air gaps between the poles and the core. However, when the armature is 90 degrees out of alignment (as in Fig. 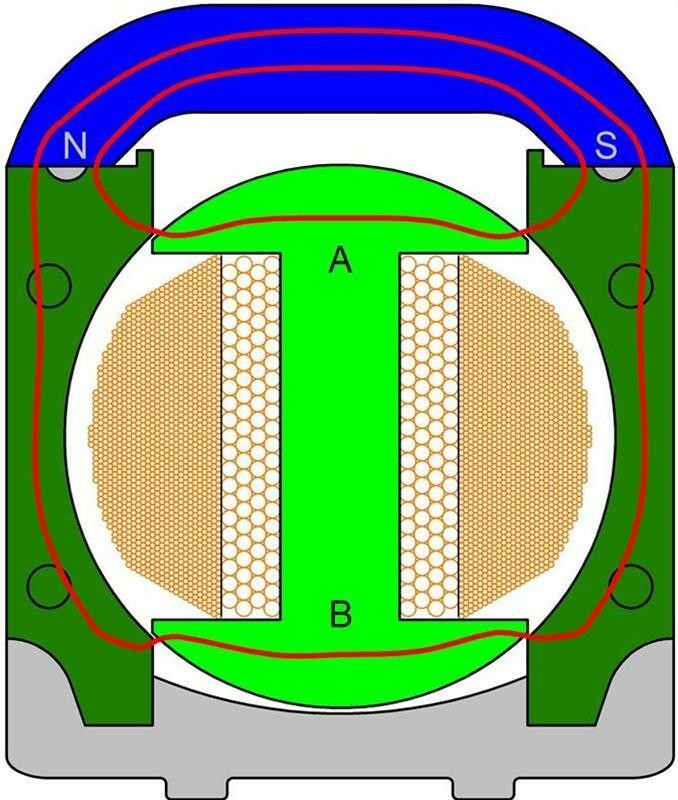 3), it becomes much difficult for the magnet to force the flux into and out of the armature core. The air gaps at the tips of the 'H' of the armature core have shrunk in length to almost nothing, and the small regions of steel adjacent the air gaps can become saturated. To prevent the magnet having too much difficulty, some magnetos (including the Lucas K1F, K2F, KVF, N1, KN1, MO1 and MN2) have a 'self-keepering' feature. The steel laminations in the magneto body extend from the magnet past the pole faces to two limbs which wrap around underneath the armature and almost meet, having a small gap of about 1/8 inch between them filled with the aluminium (grey) of the magneto's cast body. Aluminium behaves magnetically like air. These 'self-keepering' limbs therefore provide a path for some of the magnet's flux. When the armature is in the position shown in Fig. 3, they take some of the flux to reduce the amount of demgnetisation of the magnet, but when in the Fig. 1 position, there is still enough flux passing through the armature. Experiments conducted by us on a Lucas K1F and a BT-H KC2 show that if the magneto is fully magnetised with its armature in the Fig. 1 position, then the first time it is moved to the Fig. 3 position, the BT-H's magnet permanently loses about 6% of its strength, whereas the Lucas' magnet loses only about 3% of its strength. The high-energy magnet ... does not need a keeper across it; although a very small amount of energy is lost at the first removal of the armature, subsequent removals do not affect it. 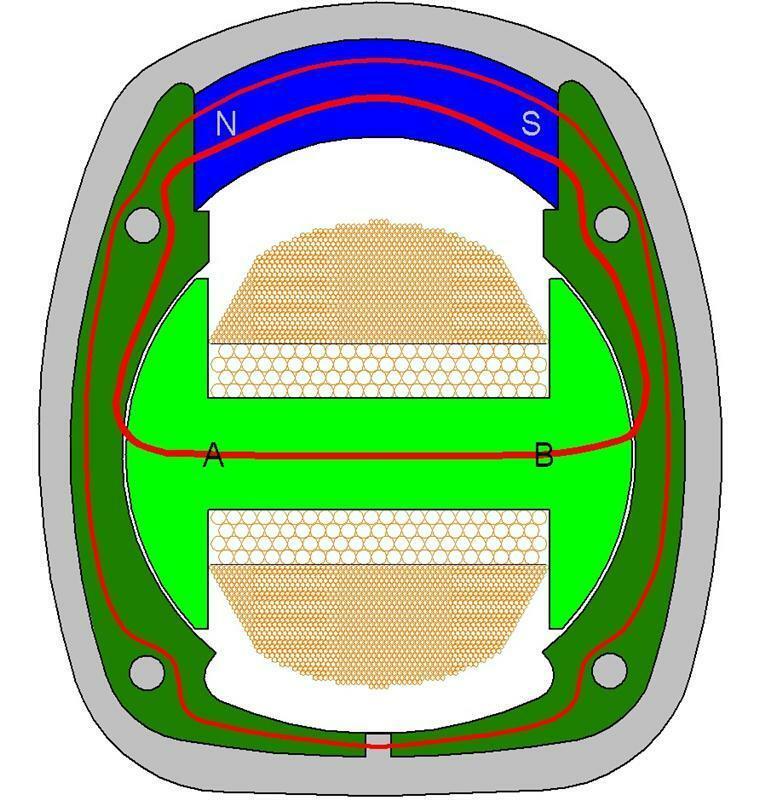 It is of course possible to provide an external keeper for the magnet of the BT-H magnetos and other magnetos without a self-keepering feature, as shown schematically in Fig. 5. We find that lightly clamping the magneto between the jaws of a heavyweight 6-inch cast-iron vice works very well indeed. With the BT-H magneto used in our experiment, removing and replacing the armature while the body was clamped in the vice resulted in no detectable loss in the strength of the magnet below the 6% loss caused by actually rotating the magneto's armature. 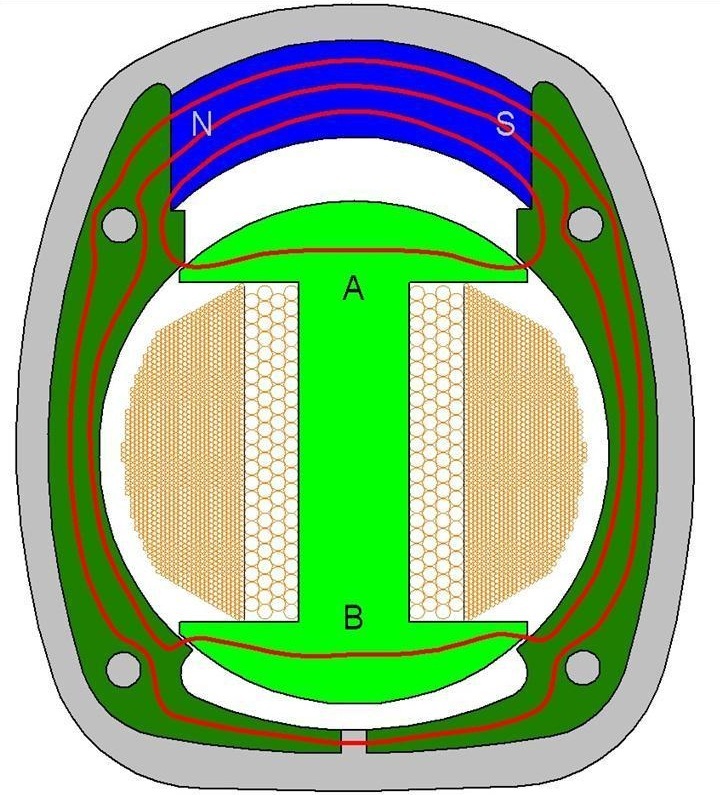 With BT-H magnetos and other magnetos without a self-keepering feature, it will also be appreciated that, if the magneto's magnet is magnetised using an internal magnetiser, an external keeper should be used while the magnetising core is removed from the magneto body and replaced by the magneto's armature, otherwise the magnet strength will end up being 20% or more less than it could be. Another effect that can partially demagnetise a permanent magnet is exposure to an opposing magnetic field. The magnet in a magneto is exposed to just that. 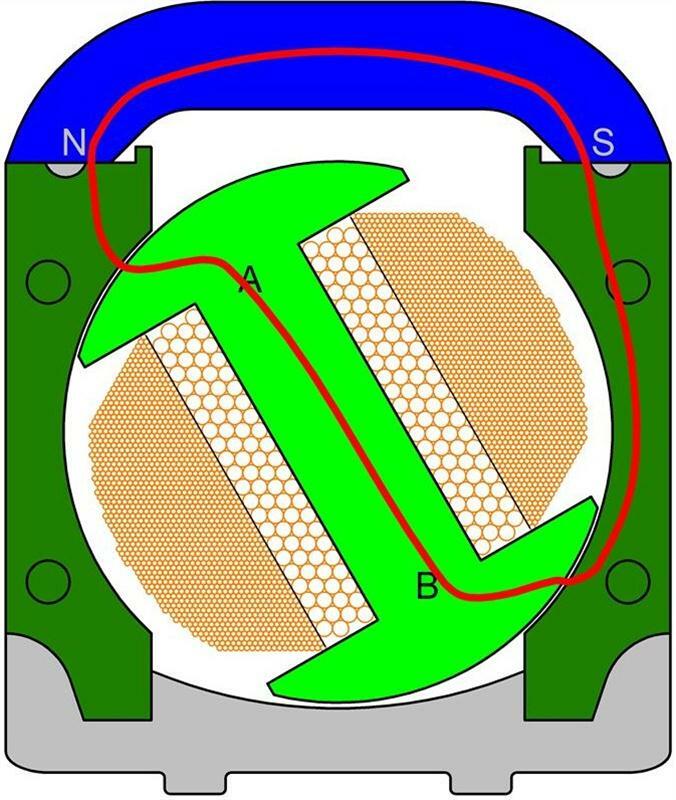 When the magneto is operating, the electrical currents in the windings (orange) produce a magnetic flux in the armature core opposing the flux caused by the magnet. 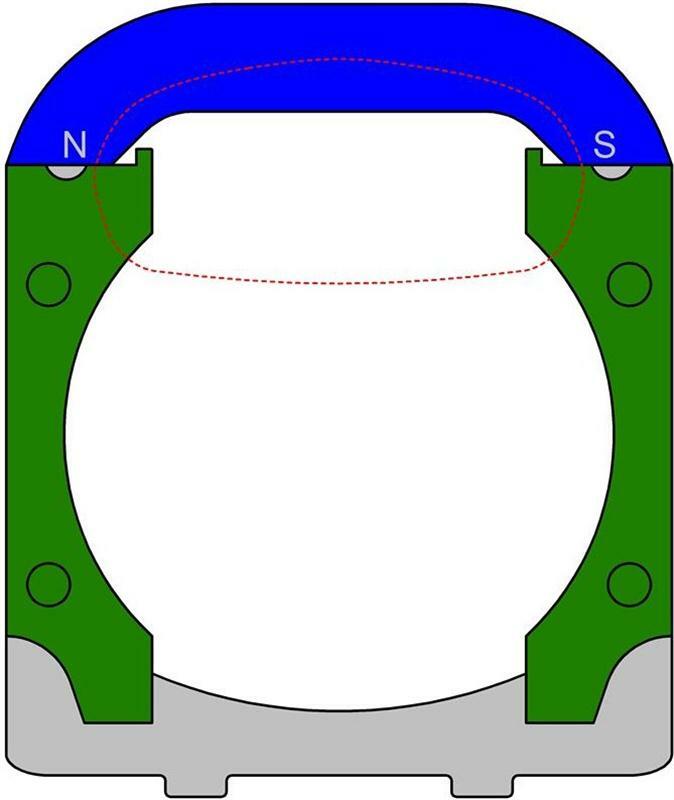 Our tests have shown that with a Lucas K2F magneto, the magnet's strength is knocked down as a result of this opposing magnetic field to a level less than when the armature is removed. Some further detail of the self-keepering limbs of the pole shoes, to reduce the demagnetising effect of armature reaction and armature removal, is contained in Bosch's British patent No. 171087 (opens in a new window) dating back to 1920. 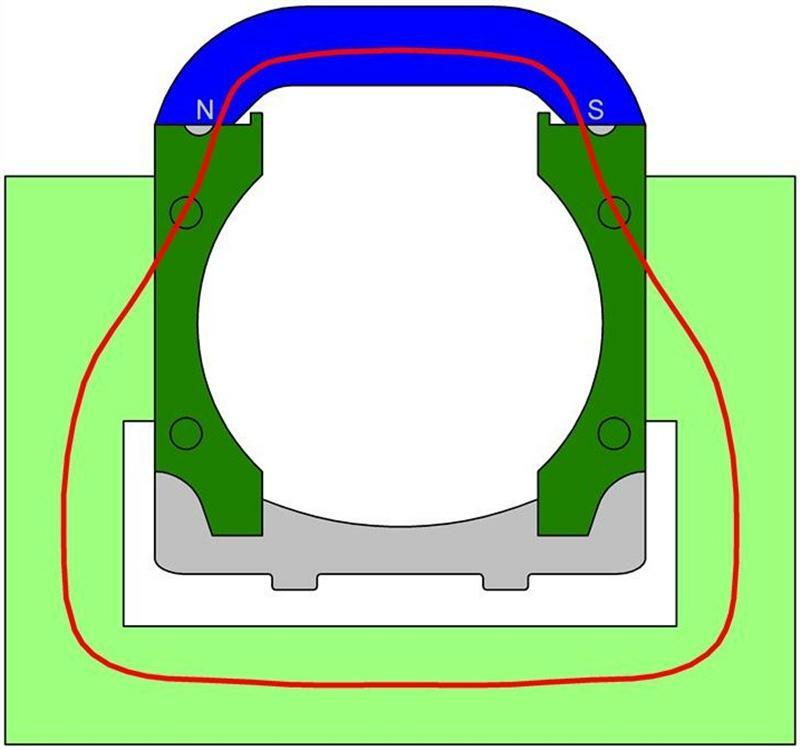 So, going back to the original question "2", for the Lucas K1F, K2F, KVF, N1, KN1, MO1 and MN2 magnetos and other devices having an effective self-keepering feature, there is no significant benefit in using a keeper when removing and replacing the armature. For magnetos without a self-keepering feature, either an external keeper should be employed while the armature is out, or the magnet should be remagnetised after the armature has been replaced. Translations provided by the Google Translate service. Brightspark Magnetos Ltd disclaims responsibility for any errors in the translations. Regrettably, some Acrobat .pdf files might not load correctly in the translated versions of the pages.